Chris Bachman currently holds the position of Vice President of Corporate Safety at SRS Distribution. Chris brings over 23 years of Safety & DOT experience to the company. Prior to joining SRS Distribution in 2018, Chris had been in the Oil & Gas industry for 5 years working for BakerCorp as the VP of EHS in Plano, TX. He had responsibility for Safety, DOT, Environmental, Risk and Insurance. 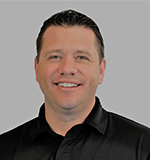 Prior to BakerCorp, Chris spent 13 years in several roles for Safety-Kleen including the Director of Safety where he drove the operational implementation of initiatives and processes that built the foundation of a company-wide safety culture change. Chris holds a Bachelor of Science degree in Environmental Health from West Chester University and a Master of Science degree from Temple University in Industrial Hygiene. He is a Certified Safety Professional (CSP) and Certified Hazardous Materials Manager (CHMM).